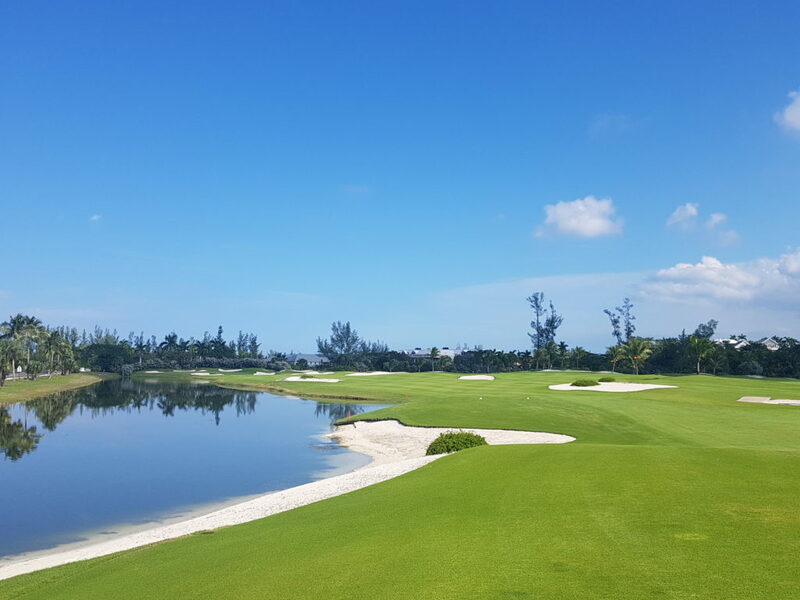 Home Course features Royal Blue Golf Club – A Crown Jewel In Bahamas Golf. 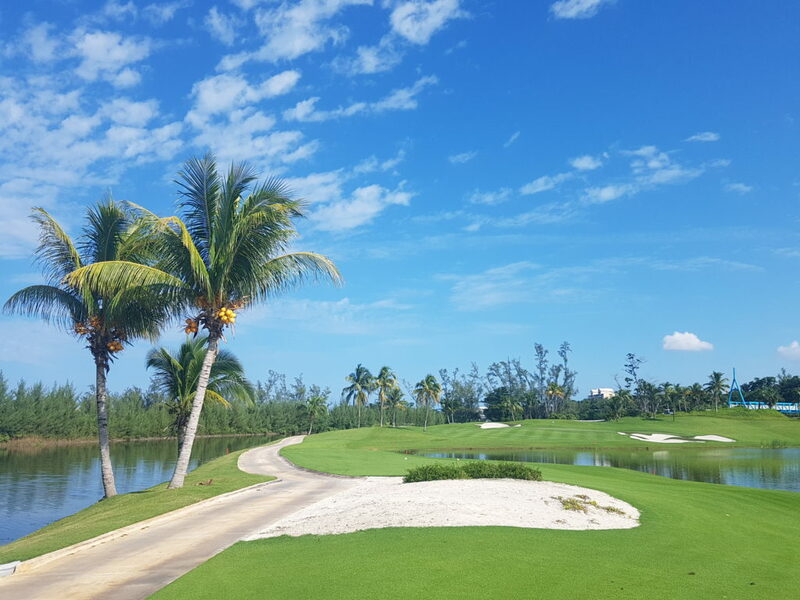 Royal Blue Golf Club – A Crown Jewel In Bahamas Golf. 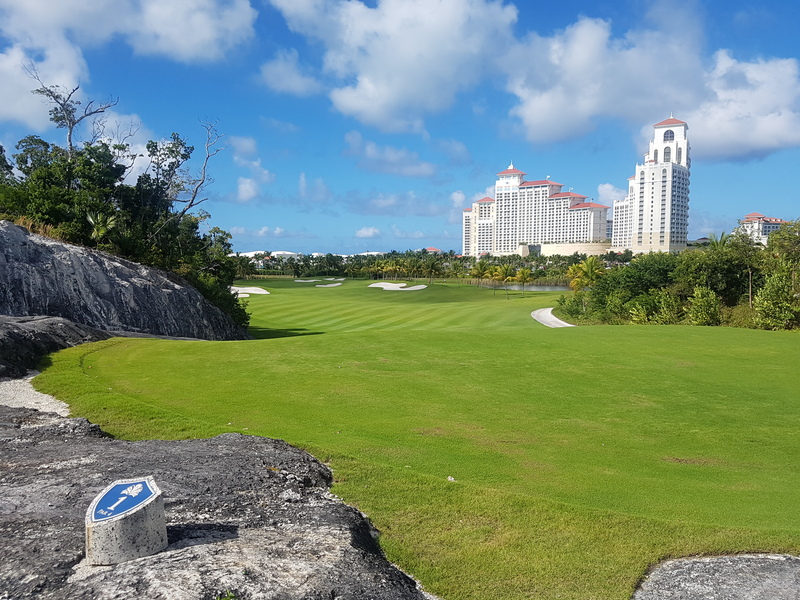 4 months ago by Bernie McGuire Comments Off on Royal Blue Golf Club – A Crown Jewel In Bahamas Golf. 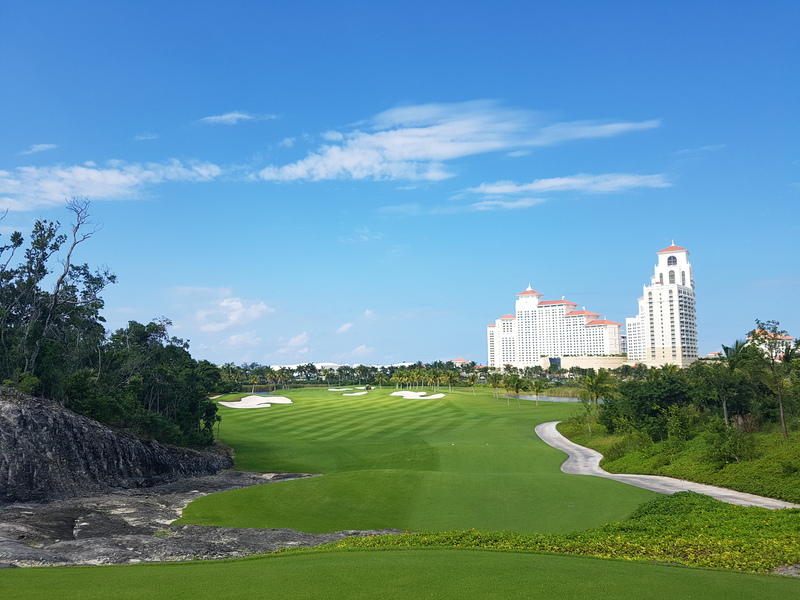 In less than two years the stunning and immaculately presented Royal Blue Golf Club has become a crown jewel in Bahamas golf. 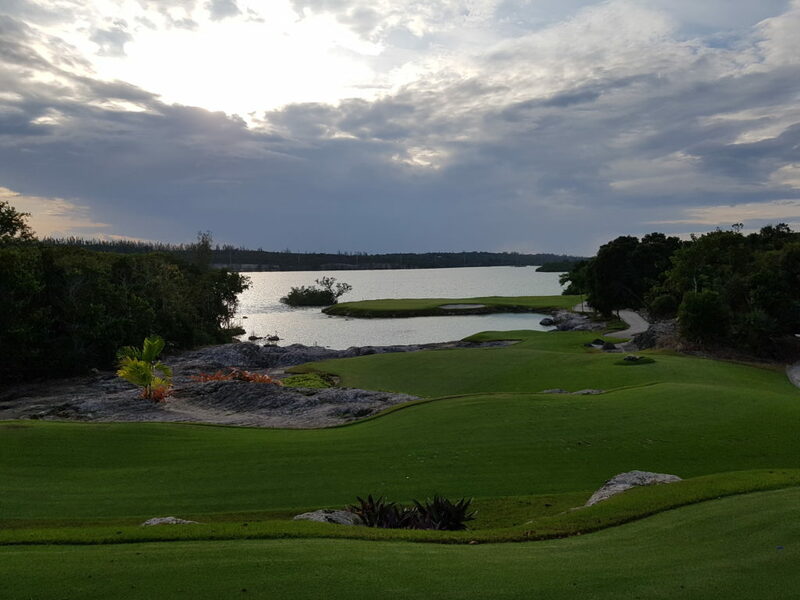 Royal Blue is the first Jack Nicklaus ‘Signature’ golf course in the Bahamas and officially opened for play in May 2017. 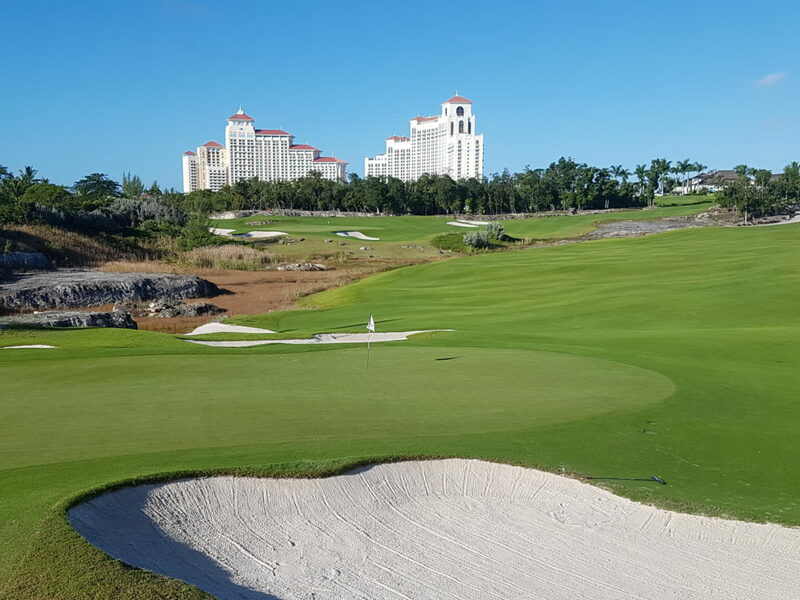 Those of us who reported on the 2015 Hero World Challenge, and the first time the Tiger Woods hosted event moved to the Bahamas, we would drive past each day seeing the sad sight of a golf course but with no golfers. 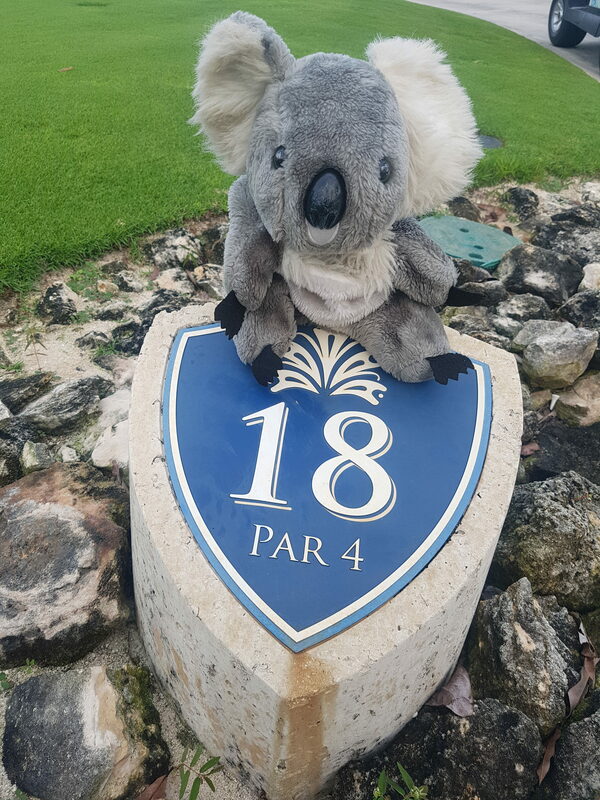 The course was named TPC Baha Mar, and named after the majestic-looking Baha Mar Hotel/Casino resort laid-out on along the blue Caribbean at Cable Beach. That too looked deserted and was not open. 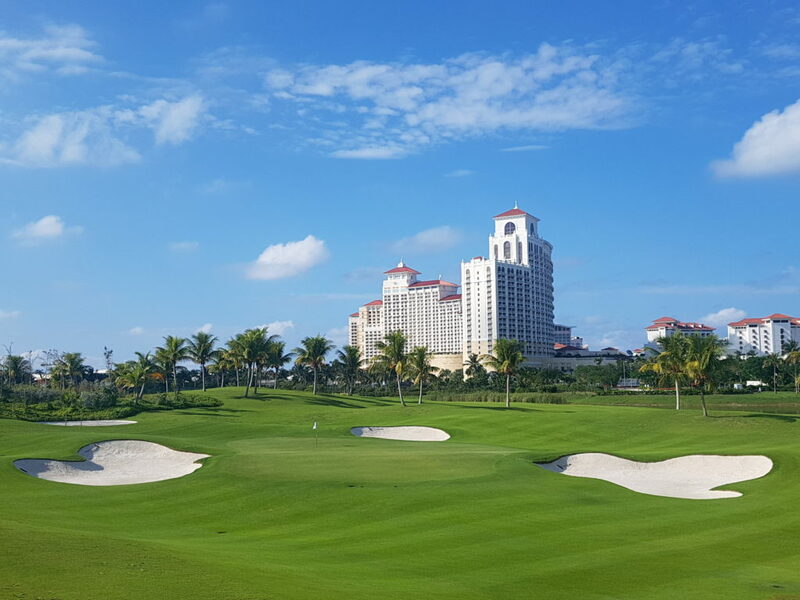 The golf course itself had been due to open in May 2015 however with the 1,000-acre project almost complete, the resort declared bankruptcy, leaving both the hotels and the golf course in limbo. Both were sadly still in limbo when we returned for the 2016 Hero World Challange but fortunately a team was employed in order to preserve the greens. Fortunately, it was not all despair as there was then a double dose of good news when the resort came under new ownership and the Scottsdale-based OB Sports took over management of the golf course and immediately investing $1/2m in not only redoing every bunker but ridding the course of a disease that had crept into the fairways during the bankruptcy. 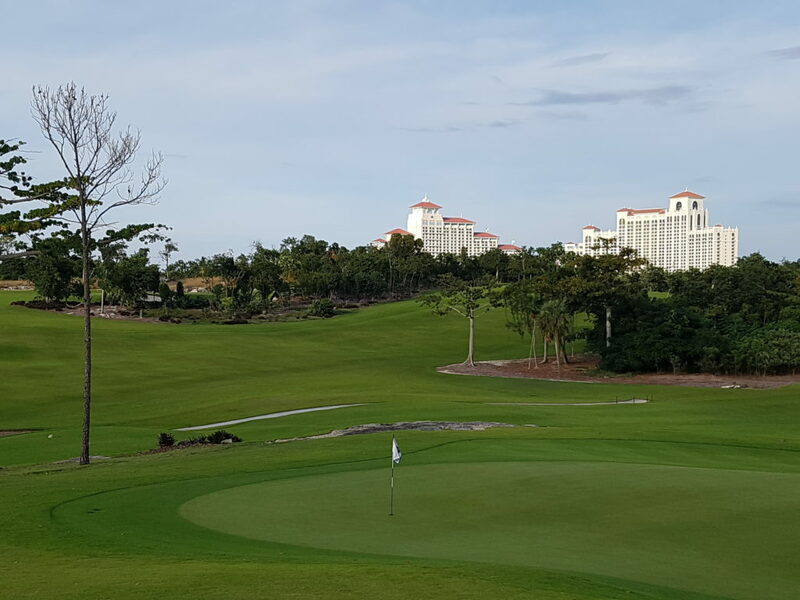 Then in May 2017 the Grand Hyatt Baha Mar resort and now-named Royal Blue golf course was officially opened. 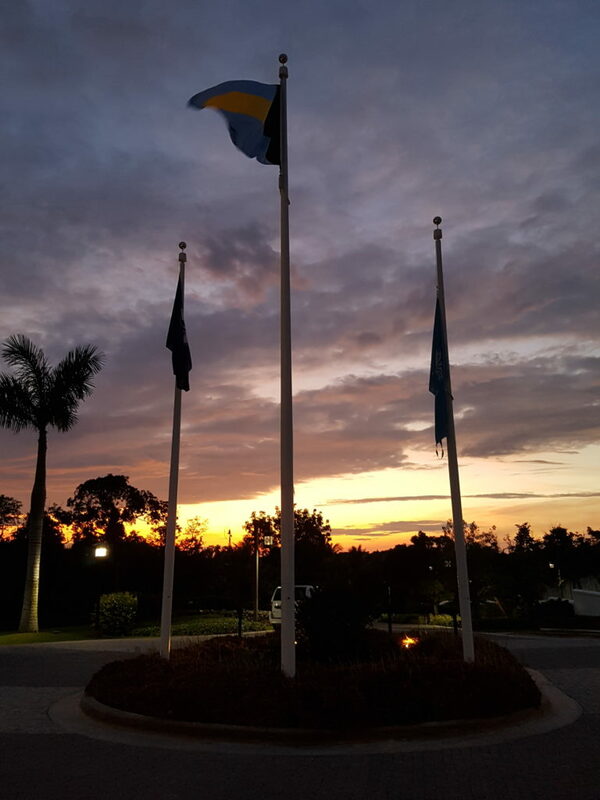 You could imagine our surprise, and just around a 15-minute drive from Nassau International Airport, to be greeted now by a fully operational $4.2m Baha Mar Hotel/Casino Resort and there right across the road the now much-alive picture postcard Royal Blue Golf Club. 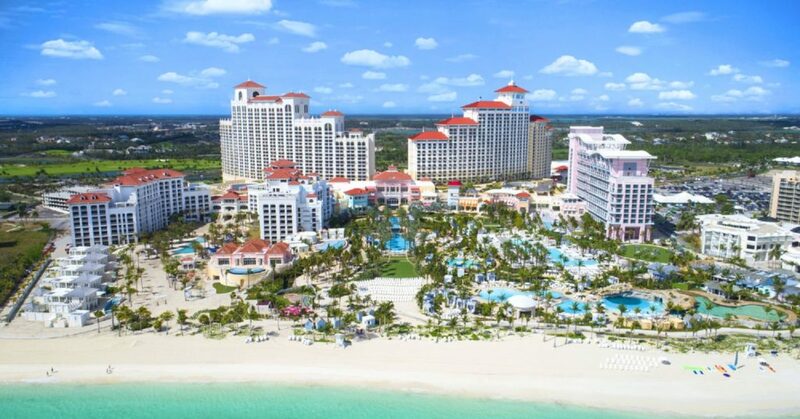 The resort also boasts within the hotels complex the Baha Mar Convention, Art and Entertainment Center; Peter Burwash International tennis courts and facilities; multiple restaurants, bars and lounges; even a Starbucks as well a gastropub called the ‘Swimming Pig’; select ESPA spa experiences; the resort’s extensive pool and beach areas and the entry show lakes and fountain shows choreographed to music, film and lights. On the Tuesday night ahead of the 2017 Hero World Challenge, Royal Blue very generously welcomed members of the visiting media in hosting a superb cocktail function within the stunning clubhouse. We were very warmly greeted by Director of Golf Sean Cracraft, a former Senior VP of Operations at OB Sports, and Sean’s fellow OB colleague, Andy Deiro and appointed as Head Golf Professional. To spend the week in the comfort of the Baha Mar hotel was remarkable. To stroll down to the beach, dip your toes into the turquoise Caribbean and relax on the golden sands sipping a Bahamas Mama was to do die for. 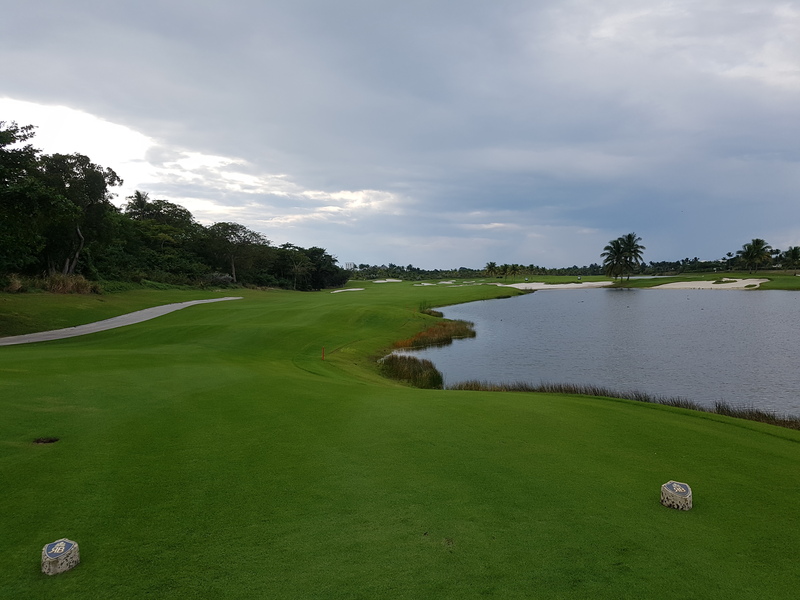 But to tee-up on the immaculately-presented Royal Blue course was nearly akin to having died and gone to golf course heaven. The course has been rejuvenated from being near lifeless to a very warm greeting upon arrival at the cluhhouse ahead of stepping onto absolutely pristine tees while findig carpet-like fairways with your drive and thus avoiding golden sand bunkering to moonscape-like features, a stunning signature hole island green and then putting-out on first-class greens. 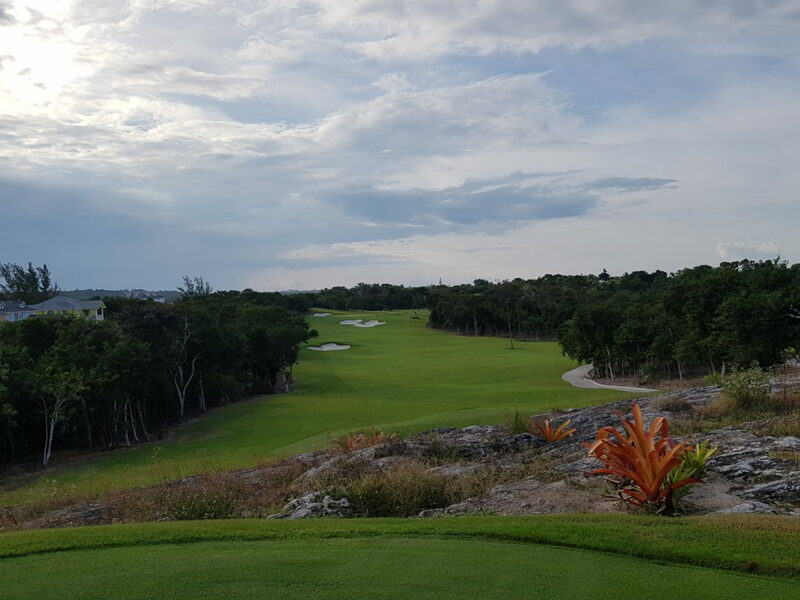 What is unique at Royal Blue is that it presents two very contrasting nine holes and teeing-up from the just one tee on each of the 18 holes. Unlike many golf clubs, Andy and his team will assess the weather and move the lone tee on each of the 18 holes accordingly so that on some days you could be playing near the back or on another, up front. From the very tips the course plays to 7,068-yards with a par of par-5s and par-3s on each half. The opening nine is relatively flat where tropical palm trees abound and with water coming into play on all but one hole while the inward half is the complete opposite very undulating and with for the most part dense jungle-like lined fairways and where water will capture an errant shot on just two holes – the downhill par-4 10th hole and the spectacular par-3 16th. The 10th, measuring 377-yards off the back, is a downhill slightly dog-leg left hole to a green guarded by marshland on the right and ready to catch any tee-shot long and with the green guarded by bunkers while there’s what the club describes as ‘moonlike’ features at the back of the green, and where there is a pathway carved out of the rock where you make you way after parking your cart to walk onto the green. There’s a great photograph to be taken in leaving the green presenting a view back up the 10th hole, the adjointing par-3 12th and in the distance the stunning Baha Mar Hotels dominating the sunshine-splashed skyline. After playing the par-5 11th it is back past the practice putting green adjacent to the first tee and then up to the par-3 12th hole. 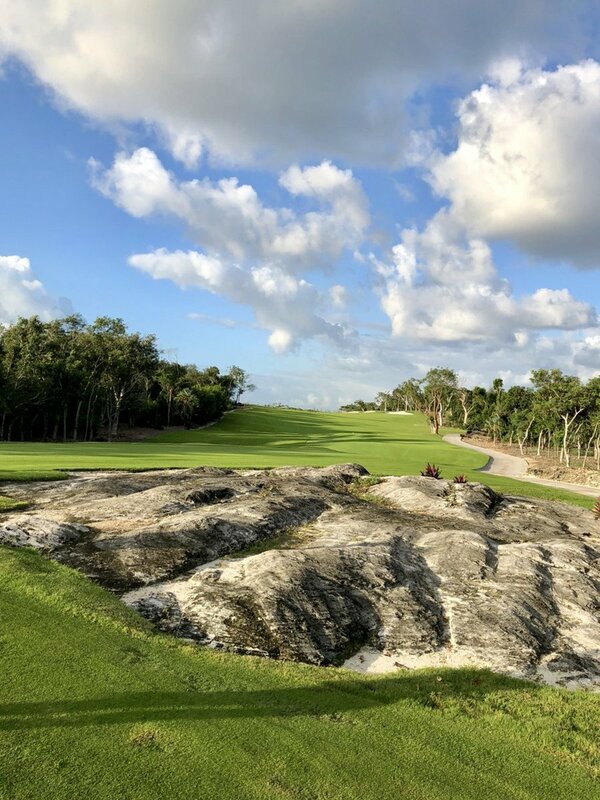 After tackling the 12th, the cart path then leads you past the entrance to the club and under the roadway to complete your round by playing the closing half-a-dozen holes. The uphill, and very well bunker guarded, par-4 14th is the No. 1 index hole while the adjoining and now downhill par-4 15th is an unsung hero with a par or better here putting you in right mind to face the 16th. Just make sure your phone has plenty of battery life as the 16th, and very much akin to the famed 17th at TPC Sawgrass, is a ‘must-take’ photograph hole. The 16th measures 165-yards from the back to a narrow but also wide green surrounded almost by the waters of Lake Cunningham and where there’s no future being either short or long. It’s a daunting shot but then what joy if you walk off with a humble par. Better still, a birdie! 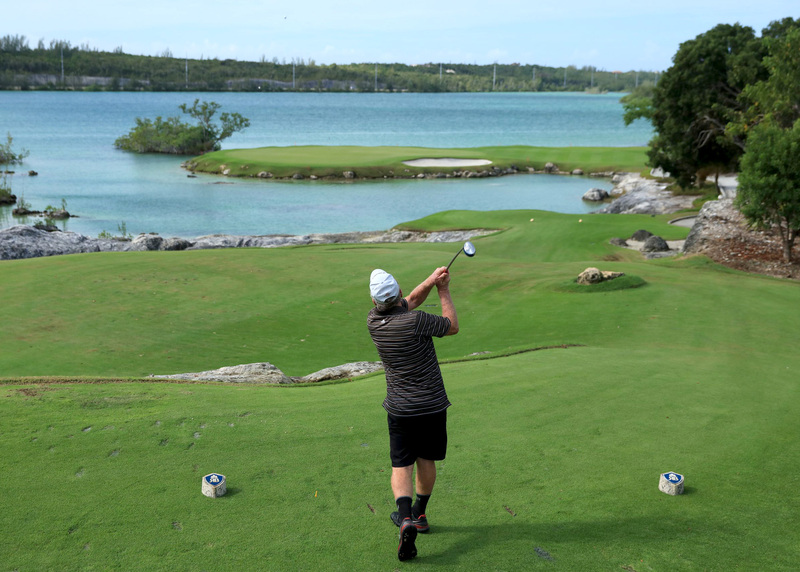 Nicklaus certainly never does any golf course designing by half-measures. The experience at Royal Blue also doesn’t begin on the first tee as the club presents the opportunity to hire clubs and they’re not your ‘no-name’ or ‘never heard of this brand’ of clubs as their clubs made by Itobori and PXG—as well as current models from Titleist, Taylormade, and Callaway and all possible thanks to Royal Blue’s “better-than-your-own” club rental program. 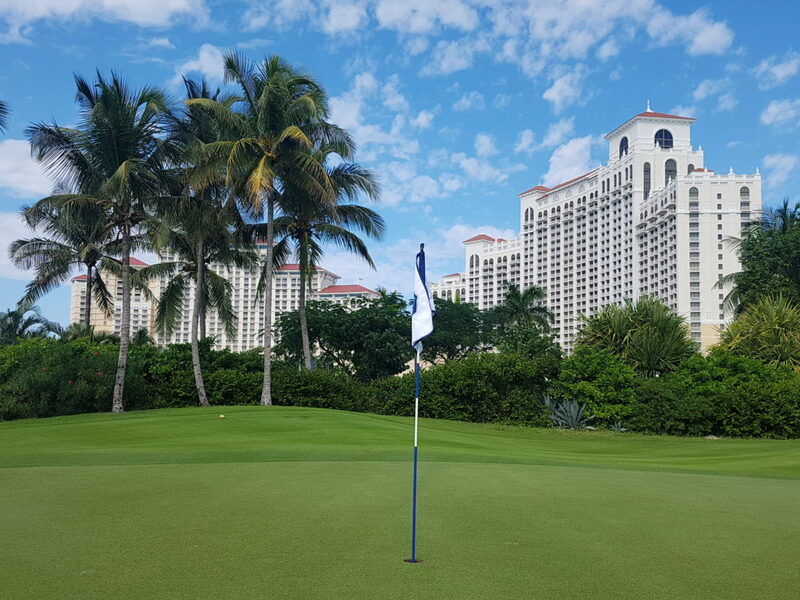 For $350 ($55 more than the club’s standard greens fee), guests can enjoy the “all-in” package, which includes rental clubs, rental shoes (if needed), and two sleeves of Royal Blue logo Titleist Pro-V1 golf balls. 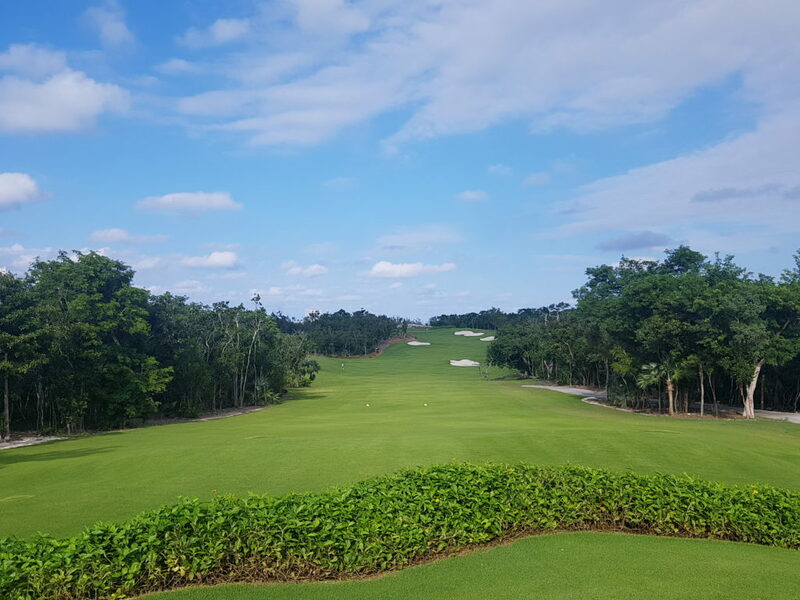 The rental program, combined with the club’s free-flowing tee box system, has created a unique resort golfing experience, one that could someday change the way other public and private courses—in all parts of the world—manage and deliver the game. 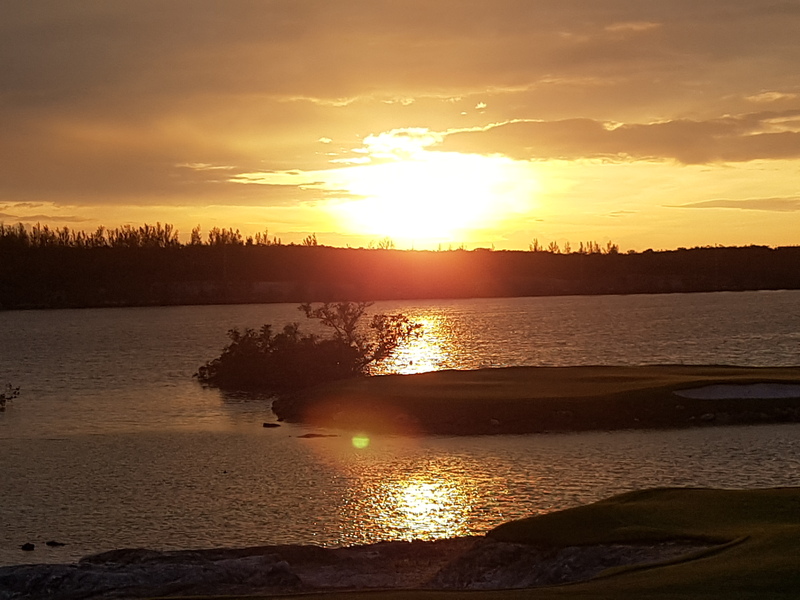 In conclusion, I cannot thank Sean, Andy, Georgette and the team enough for their welcome, their hospitality and the opportunity to play the crown jewel in Bahamas golf.